NETWORK FINALS: The SHARK TANK rerun lost 0.1 in final numbers. CABLE HIGHLIGHTS: VH1’s BLACK INK CREW led Wednesday cable, up 0.05 to 0.54. Bravo’s REAL HOUSEWIVES OF NYC slipped 0.02 to 0.47. Fox News’s HANNITY was the #3 show of the night, but it was considerably down from earlier in the week at 0.34/0.58/3.5M, with MSNBC’s RACHEL MADDOW SHOW at 0.28/0.44/2.8M, and CNN TONIGHT at 0.20/0.25/900K. On HGTV, BROTHER VS BROTHER lost 0.03 to 0.34, and both HOUSE HUNTERS and HOUSE HUNTERS INTL were at 0.30, respectively up 0.03 and 0.06. TBS’s FULL FRONTAL gained 0.02 to 0.33. Food Network’s GUY’S GROCERY GAMES rose 0.04 to 0.32. A&E’s OZZY & JACK’S WORLD DETOUR returned at 0.27, and the season premiere of WAHLBURGERS was at 0.24. 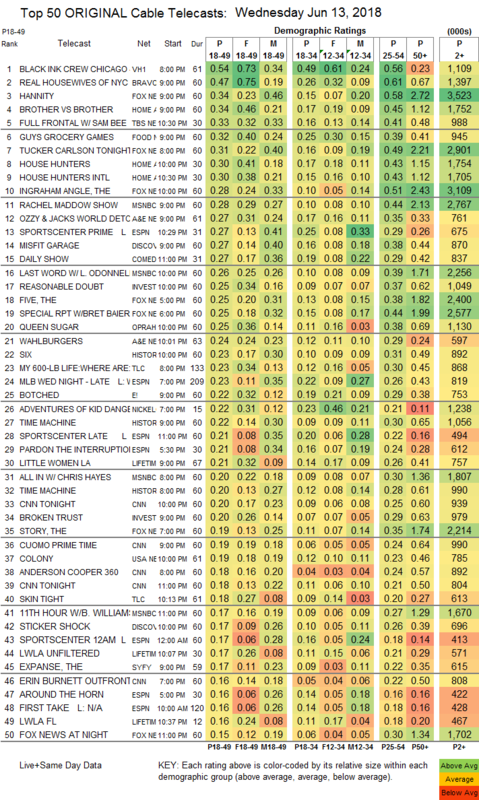 On Discovery, MISFIT GARAGE returned at 0.27, and STICKER SHOCK was up 0.05 to 0.17. Comedy Central’s THE DAILY SHOW found itself in the Top 15 at 0.27. On ID, REASONABLE DOUBT premiered at 0.25, and BROKEN TRUST started at 0.20. OWN’s QUEEN SUGAR climbed 0.03 to 0.25. History’s SIX rebounded by 0.08 to 0.23. On TLC, MY 600-LB LIFE gained 0.03 to 0.23, and SKIN TIGHT ticked up to 0.18. E!’s BOTCHED rose 0.03 to 0.22. 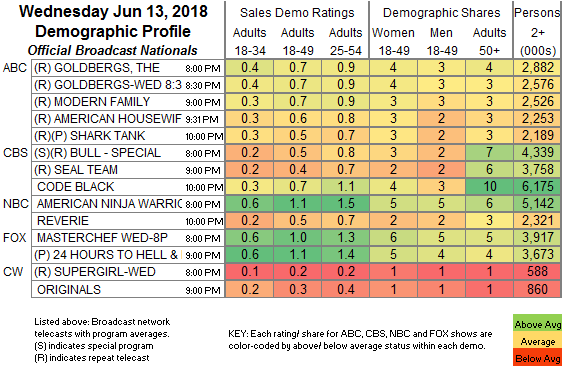 Lifetime’s LITTLE WOMEN ticked up to 0.21. USA’s COLONY dipped 0.02 to 0.19. Syfy’s THE EXPANSE ticked up to 0.17. The season finale of FXX’s ARCHER rose 0.01 to 0.15. IFC’s BROCKMIRE returned at 0.05.